Discussion in 'Apple Watch Accessories' started by wepiii, May 10, 2015. What do you guys think? Looks pretty good in the pictures. For $28.99 and a potential $120 savings i'm in for 1. I'll post pics when I receive it. I think the band looks very nice for the price. How in the world did you ever find it? I liked it so much I just now purchased one for myself. Now I just need my watch and I'll be in good shape. Thanks so much for sharing this link. i often shop at Aliexpress, I believe it's a part of Alibaba group and it's massive!! mos to my purchases arrives within a month (once a merchant didn't ship it for over a month and I got mad and canceled the order). it's a great place to buy things if you aren't in a need to get it asap. I've been looking for black link bracelet, are you having any luck? You'll probably get stick for buying from Ali Express, but i buy all the time from there, i have bought some apple watch adapters from there too, and some bands. takes a few week to come though. Yes, that is strange. Who knows! Me too. Love that site. i am also wondering, probably he is buying it for 20$ and one it thinking he can get from us 70$ the other one only 30$. The reason it so cheap is not because they buy it cheaper on Aliexpress, it's because they all sell directly from their factories. The sellers make the items from scratch, no middle men involved. 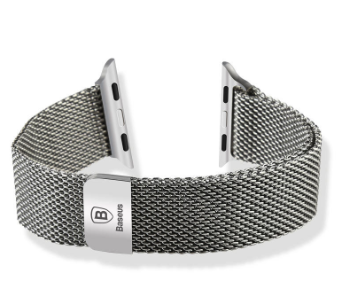 Heres a black Milanese band which would go on a adapter. I think i will order one too after i have my watch and tried it on, on Tuesday. I'd say to go for it. The prices is very reasonable. I never received an email from the seller, but I ordered a 42 mm band. I'll let you know if I hear from the seller. I don't have my watch yet either. Also eBay sell some nice bands, search for HOCO bands. Is this place legit? U.S. Based? Is it like eBay? You've gotten some nice bands, especially the black ones. I got a couple of sports bands off eBay yesterday for around $15 US $ per band. Do those fit the Apple Watch though? Dont you already have it ? Lefty21 and schmidt65 like this.